After being diagnosed with celiac disease and starting a gluten free diet, one of the most common ways to get glutened ( is that even a word?) is through gluten cross contamination. Here are 10 ways to prevent gluten cross contamination in your diet. Lots of people don’t realize that unglazed stoneware such as Pampered Chef is extremely porous. Gluten can easily get stuck in those pores and no amount of cleaning will remove it. I used to be a Pampered Chef rep so I had lots of stoneware. Unfortunately, it was all contaminated with gluten. I did everything I could think of to clean off the gluten, including using soap and running them through the dishwasher (both BIG no nos!). Nothing worked. Even after I cleaned the stoneware every way I could think of, my husband still got sick. Luckily, I was still a Pampered Chef rep so I got just a few brand new stones that I used all the time and made them exclusively gluten free. I also labeled them gluten free in the back with a permanent marker so there would be no confusion and cause no gluten cross contamination. Resist the urge to cook in your great grandmother’s old well seasoned cast iron skillet that has been handed down through the family and makes the BEST cornbread. Sorry, cast iron is even worse than unglazed stoneware when it comes to gluten cross contamination. The seasoning in cast iron pots and pans is formed by hardened oil. Gluten can get trapped in this oil as it is forming and can’t be completely removed without ruining the pan. 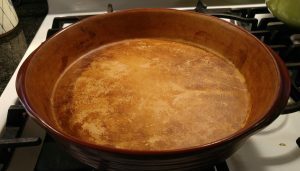 It is best to start off with a brand new pan that has never touched gluten and keep it as a dedicated gluten free pan. Even if you think you wiped them down after the last thing you cooked, things happen and other people forget. The above picture is what I usually find after someone else in my house has made lunch….. bread crumbs on the cutting board. Everyone seems to think I’m the housekeeper around here (sigh..). Had I assumed the counter was clean and those crumbs were from gluten bread, it would have been a problem. When baking, flour can go everywhere. The picture above is of my Kitchenaid mixer after baking one batch of chocolate chip cookies. If you are going to bake anything with flour you have to be very thorough about wiping everything down when you are finished. Early on I decided to only use gluten free flour and mixes when baking to cut down on the risk of gluten cross contamination. Because I cook very few dishes with gluten, I have a few utensils labelled “Gluten.” This way there is no chance I will get mixed up and dip a spoon full of gluten into the pot with gluten free sauce. I have actually switched to mostly silicone cooking utensils because they are easier to keep clean. 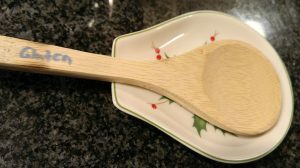 If you like to use wooden spoons make sure you get a brand new spoon for your gluten free cooking. It is extremely difficult to get a wooden spoon completely clean of gluten. Just like the wooden spoons, wooden cutting boards are difficult to get completely clean. If you use a particular cutting board to cut bread, then don’t use it for your gluten free food. It may seem obvious not to put your gluten free spoon into a pot of gluten filled meatballs but it’s just as important not to lay it down on a spoon rest that you just used for the actual spoon for those meatballs. 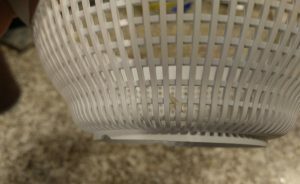 All those little holes in a colander can get food trapped in them. Even if you run it through the dishwasher, it may not get completely clean. The picture above is of a colander that just came out of the dishwasher (don’t worry I’ll wash that all off before I put it away!) I’m sure you are very careful about emptying the dishwasher but I know there are few people in my house, who shall remain nameless, that aren’t great about checking everything. I’m always careful about checking things before I use them but all it takes is one time to be glutened (ok, we’ll just make it a word!). Slotted spoons can have the same problem. This is the ideal situation but many times there just isn’t enough counter space to do that. When we have too much food for separate counters (too much food is a common occurrence in this Italian family), I make sure that the gluten free dishes are behind the gluten dishes so that crumbs from the gluten dishes don’t drop into the gluten free dishes and cause gluten cross contamination. When throwing a party, make sure you label the food that is gluten free. This will help the gluten free people find what they can eat but also remind the other people not to contaminate it. If you have less dishes with gluten, then reverse this and label the dishes which contain gluten. It’s also good to label any condiments in your refrigerator that are supposed to remain gluten free. The only trouble we ever had with this was when guests came over for lunch and we served sandwiches. Knives go into the jars of mayo, jelly or peanutbutter more than once and, BAM, you’ve got gluten cross contamination. It really wasn’t the guests’ fault. They hadn’t been trained to be careful about these things. I generally watch them like a hawk but labels on the jars and sometimes having two seperate jars (gluten and gluten free) usually solve the issue. This one has tripped us up more than anything else. Make sure your waiter or waitress really understands what gluten free is and how sick you can become. If I really don’t like what I hear from the waitress I will be extra cautious and not eat the item in question. It’s just not worth feeling awful for days. 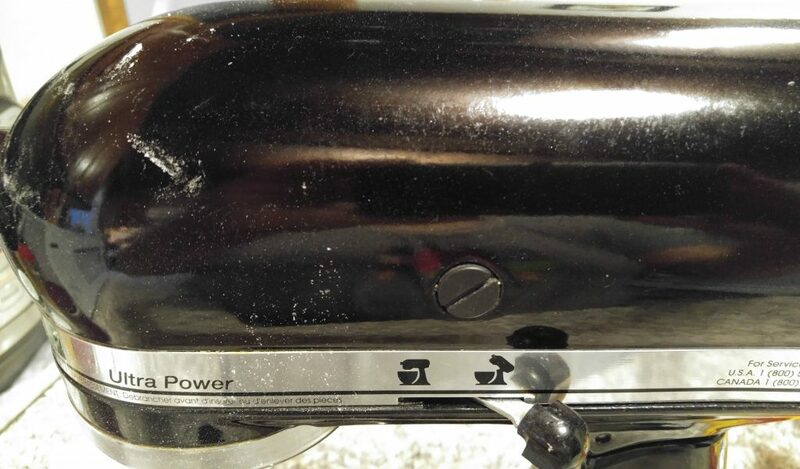 Remember the picture of the mixer above? That was from making one batch of cookies in my kitchen. Imagine how much flour is flying around in a bakery where all they do is bake things, all day. Don’t eat gluten free food from a bakery that’s not a dedicated gluten free facility unless those items come from a separate exclusively gluten free facility and they are sealed before they enter the bakery you are buying it from. In the beginning, these little details may seem overwhelming because you aren’t used to having to act like this. I promise that after a while, it becomes second nature and you don’t even realize you are paying attention anymore. 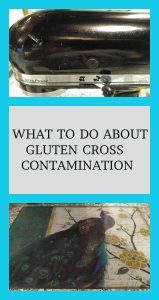 In addition, the people around you will become much more aware of gluten cross contamination so they will also get better at stopping it. This will make your job MUCH easier. Please remember, don’t beat yourself up if you make a mistake. Just keep trying and it WILL get easier. 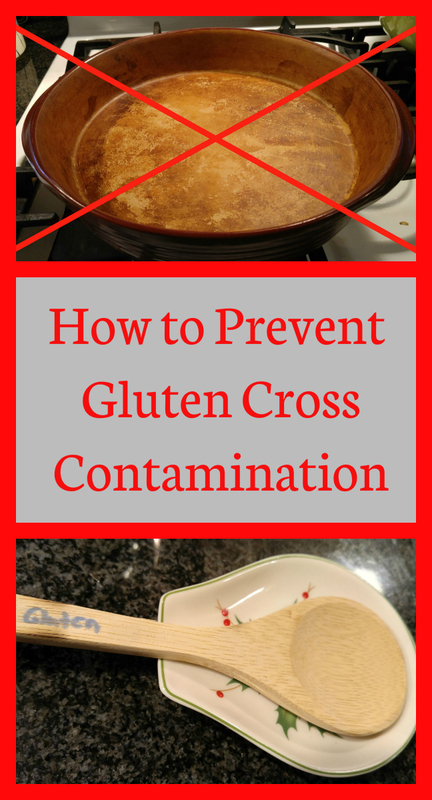 When have you had to deal with gluten cross contamination? Leave your stories in the comments below….